Next Sunday's game at San Diego could be an opportunity for Kansas City to rest its workhorses -- including running back Jamaal Charles -- now that the Chiefs' No. 5 playoff seed is locked in. KANSAS CITY, Mo. 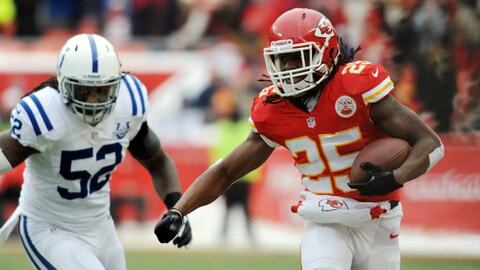 — Five things we learned from the Chiefs’ 23-7 loss to the Colts. With the Chiefs’ upset loss to the Colts, and the Broncos’ win Sunday, the Chiefs are now locked into the No. 5 seed for the playoffs, which makes next Sunday’s game at San Diego meaningless for the locals. It will be interesting to see how Andy Reid plays it: Will he rest most of his starters? Will he treat it like the third preseason game, traditionally the one preseason game when the starters play about a half and that’s it? "I haven’t even thought that far," Reid said. "I wasn’t anticipating this (loss)." Reid sure has some players who need a break, starting with workhorse Jamaal Charles. It seems doubtful, too, that Reid will rush linebacker Justin Houston or offensive tackle Branden Albert back into the game. The Chiefs will have to wait until next week to find out where they will travel, though it seems likely it will be Indianaplis, right now the No. 4 seed. Cincinnati is the No. 3 seed and holds the tiebreaker over the Colts. If it is the Colts, the Chiefs say they will be ready for the rematch. "We’ll see them again," linebacker Derrick Johnson said. "They got the upper hand on us and in their minds they think they can beat us. If we go down there, it will be a different story." Just last week Alex Smith put together an incredible performance against the Raiders. He posted a perfect 158.3 passer rating. This week he was just the opposite, and posted a meager 41.3 rating. He was just 16 of 29 for 153 yards and threw two interceptions. One of his interception was unsightly — a pick in the red zone when he underthrew tight end Anthony Fasano. "Just an underthrow," Smith said. "I lost vision and didn’t get it out there. A poor pass." The Colts seemed to fluster and bewilder the Chiefs almost all day. Several times Colts receivers were seen wandering all alone behind the Chiefs’ secondary after one Chiefs’ safety "handed" a receiver off to someone behind him — too many times there was no behind that safety, though. "If you don’t come out to play football," cornerback Brandon Flowers said, "this will happen to you in the NFL." Penalties also were a big issue as the Chiefs played perhaps their sloppiest game of the season. Johnson was called for a personal foul horse-collar penalty that extended a Colts drive in the first half. Cornerback Sean Smith twice was tagged for defensive holding, giving the Colts automatic first downs. And soft-spoken nose tackle Dontari Poe was hit with a crucial taunting penalty that extended yet another Colts’ drive. The Chiefs also had a couple chances at turnovers: Flowers dropped an interception in the first half at the Chiefs’ goal line. Then Johnson had a chance at a game-changer late in the third quarter. Colts quarterback Andrew Luck tossed an ill-advised screen pass that Johnson read. But the ball sailed through Johnson’s arms. Johnson likely would have gone the distance — 80-plus yards — and pulled the Chiefs within 20-14. Chiefs rookie Knile Davis was known as a fumbler when the Chiefs drafted him, but Andy Reid and his staff believed they could coach that issue out of him. Before Sunday’s game, mission was pretty much accomplished: Davis had fumbled just once this season in 57 touches. Then came Sunday and Davis coughed up a huge fumble in the second quarter that turned the tide of the game. With the Chiefs leading 7-3, Davis was hit by Colts defensive end Robert Mathis, not especially hard, and lost the ball at the Chiefs’ 33. Two plays later the Colts were in the end zone and ahead 10-7. And from that moment on, the Colts seemed to dominate. "Didn’t have two hands on the ball," Davis siad. "You got to have two hands on the ball. That’s going to change." Davis also fumbled on a kickoff return in the second half — fortunately for him, the Chiefs recovered. Davis needs to know that’s how quickly an NFL game can turn, and ball security is paramount in the big boys’ league. It was an interesting day for referee Tony Corrente. Numerous times Corrente either forgot to turn off his field microphone or it simply malfunctioned, and fans were "treated" to some of the screaming and profanities you would expect to hear on a football field. And perhaps Corrente got frustrated with everything. Corrente turned on his microphone late in the first half and snapped, "Will the game clock operator please pay attention … and start on my signal!" Late in the game, Corrente then reminded the clock operator that he or she failed to start the clock during a play by the Chiefs — seven seconds had to be manually run off. About a minute later, Corrente again had to remind the clock operator to reset the clock, which brought many chuckles in the press box.